Welcome to our new blog. Jinxy and I are excited to be here! 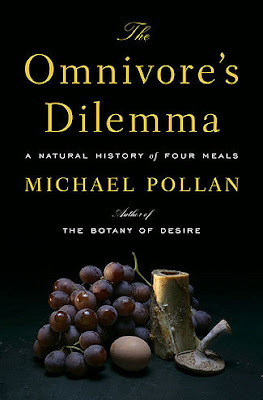 We first wanted to tell you about an amazing book we just finished reading: "The Omnivore's Dilemma" by Michael Pollan. Basically, ANYONE WHO EATS should read this book. Pollan goes into great detail to discover the inner-workings of farming and food production in the U.S. He first discusses "industrial food" and the amazing impact of corn. Did you realize that a huge number of the foods found in the supermarket have corn in them? Many of those undecipherable ingredients on a food label (calcium citrate, maltodextrin, propylene glycol) are actually corn products. Additionally, the meat department could more-or-less be re-named the "animal processed corn department" as most all commercially raised meat is fed corn. I personally found the section about corn to be absolutely fascinating and eye-opening. The book then goes on to discuss organic farming - both traditional "small-time" farming and the newer "Big Organic" which provides the majority of organic foods. The differences between these two processes are many - - as are the similarities between "Big Organic" and conventional industrial farming. The last section concerns hunting/gathering. Pollan describes his experiences hunting wild pig in Northern California, as well as foraging for mushrooms. He acknowledges that this lifestyle is not practical for today, but does incorprate ideas from this lifestyle into the overall theme of our relationship and evolution concerning food. This is a book that has made me consciously consider everything I have purchased or consumed since reading it and will definitely continue to make an impact on my future actions......and Jinxy's too!